I learned to cook from my husband, my mother, and the Internet. It is hard to classify the food I cook as Keralite, Gujarati, Mumbai-style, or anything else. It is vegan cooking, Indian-influenced. It is what works for me and the husband, and I have tweaked it endlessly to make it our own. Three big changes: Switching to the steaming method to cook vegetables, shifting to a low-carb diet, going vegan. 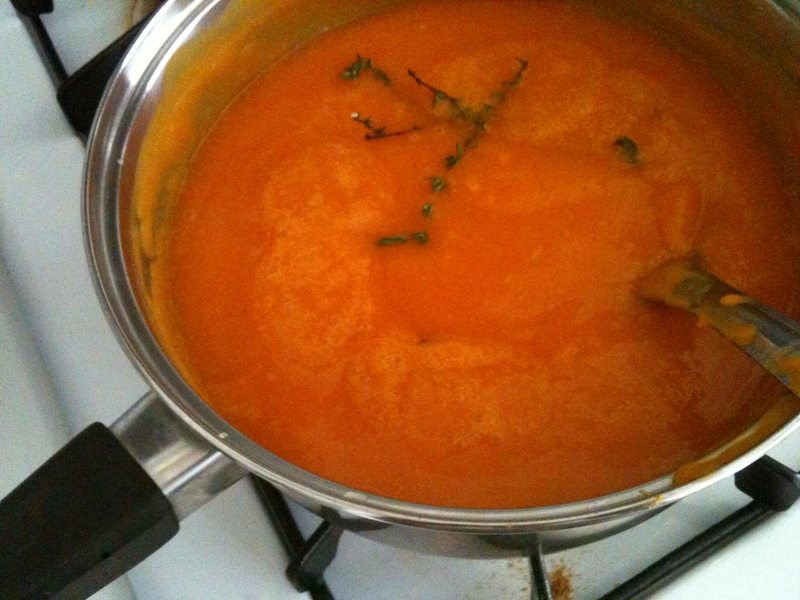 Steaming + Butternut Squash Soup + Hello Curry Powder! Picked up a butternut squash at Sandy Springs Farmers Market last week. This Saturday is the last one for the market this year. It’ll be almost six months before we see these folks again selling their produce, lovingly harvested, fresh and local, awkwardly shaped (sometimes!) yet delicious. I believe there is another market that stays open year round but it’s nowhere close to where I live or work. So winter seems set to be a period of deprivation… sigh. Access to local farmers markets year round may be the #1 reason I would like to move to the West Coast. We get delicious weather here in Atlanta as well, so sunny blue skies and cool breezes are not top of my list. Well, the grass is greener and all that stuff. 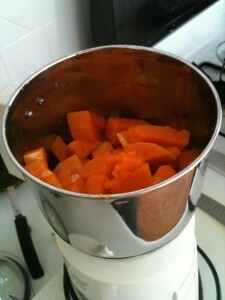 P has developed a taste for steaming vegetables as opposed to eating them sauteed, roasted or any other way. I understand that the scientific reason as to steaming being a better way to cook vegetables is that steam packs a wallop of heat at the same temperature, thus cooking the food faster at a lower temperature. Here is what Wikipedia has to say about steaming. 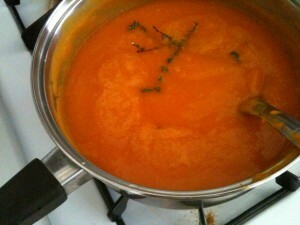 I would have liked to roast the butternut squash and then make soup out of it. Instead, I skinned the squash, cubed it and steamed it. I began steaming in the cute little IKEA steamer but had to move to a larger one since all the pieces didn’t fit in. In spite of the squash being ripe and soft, I wasn’t able to cut into it myself. 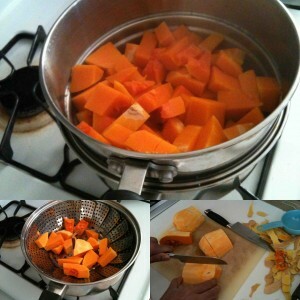 So that’s P’s hand you see slicing the squash. That you can see the peel stuck on the steamed squash says a great deal about my impatience… c’est la vie. As the squash is cooked, it becomes very soft and the color turns into a lovely orange. Let it cool a little. Another useful device I acquired on the last India trip is the Preethi Eco Chef Mixer + Grinder Set. 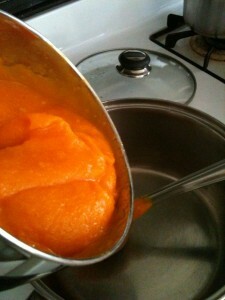 I use it to puree soups, dals, milkshakes, smoothies, chutneys, wet masala mixes, etc. There is a set of 3 jars, each one with its own locking lid. The blades are super sharp, very easy to clean and they do a great job with all kinds of blending, mixing, grinding. I totally recommend getting this brand of mixer+grinder. Preethi is an established brand and I have seen it in the kitchens of other Indian friends too. That, I think, says a lot especially if you consider the heavy-duty grinding, mixing, blending action that one sees in a typical Indian kitchen. Blend the steamed squash into a homogeneous puree. 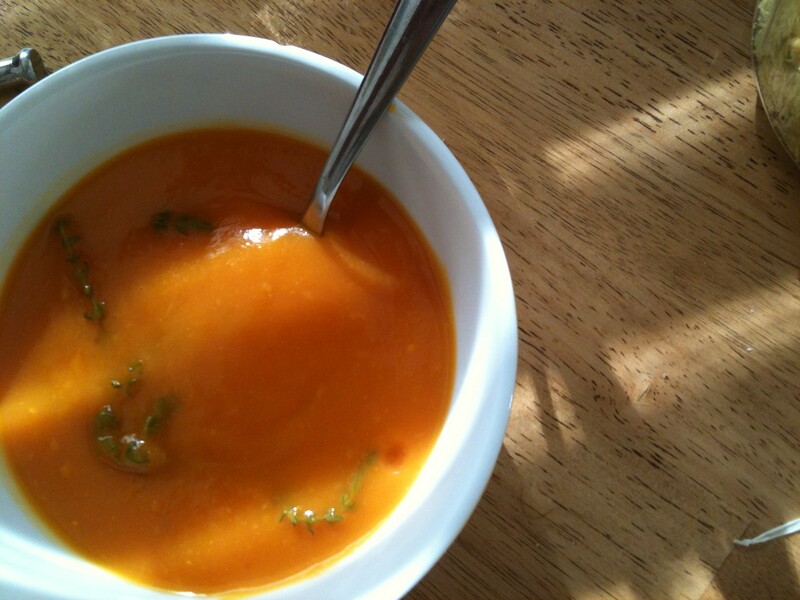 Pour into a pan, add water to achieve your favorite soup consistency and turn on the heat. You might need to add water while pureeing the squash also. I added salt, grated fresh ginger, a few sprigs of thyme and a teaspoon of curry powder, the latest addition to my kitchen. As all Indians would confirm, there is no such thing as curry powder in Indian cuisine. My guess is that this is a catch-all term invented during colonial times by the British to give a name of the various spice mixes used in Indian cooking. In the most general sense, curry refers to the sauce or “gravy” in the dish. Potato curry denotes a potato preparation in a wet spiced gravy, that’s that. As the Food Network Star Aarti Sequeira puts it, “See, “curry” means nothing more than “gravy”. There isn’t one formula to a curry. That would be like saying, there’s only one sauce. There isn’t. Every curry in the Indian repertoire has a different, specific blend of spices that go into it.” Well said, Aarti! That being said, curry powder was a good addition to the soup. A little bit went a long way. It added a certain onion-garlicky heat to the soup. Ginger brought its own bright and fresh flavor that was retained in spite of the curry powder. My little spring of thyme also lent the soup its special notes, wow! Gorgeous, huh?